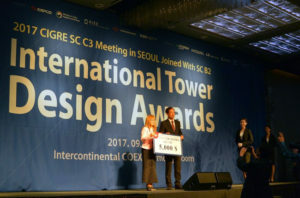 BOLD® (Breakthrough Overhead Line Design) has earned another prestigious award, the grand prize in the “International Tower Design Award” from CIGRE/KEPCO. 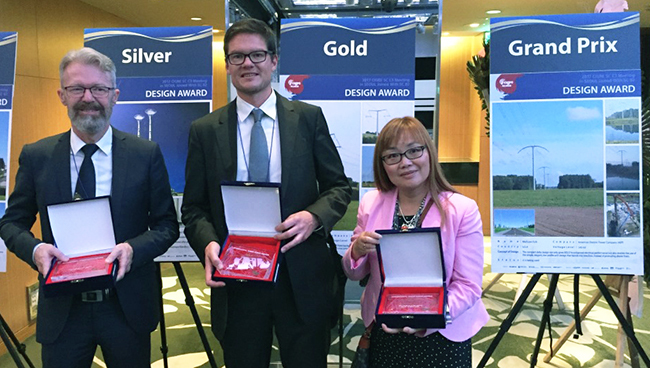 BOLD® (Breakthrough Overhead Line Design) has earned another prestigious award, the grand prize in the “International Tower Design Award” from CIGRE/KEPCO. The competition, sponsored by CIGRE Korea and the Korea Electric Power Company (KEPCO), was held in Seoul, South Korea, during the CIGRE semi-annual meetings. To take the prize, BOLD beat out 26 other tower designs from around the world. The judges recognized BOLD for its practical and environmentally friendly design, blending both performance and aesthetics. Meihuan (Nancy) Fulk represented AEP at the event and accepted the prize on behalf of AEP and BOLD Transmission. Meihuan (Nancy) Fulk (right) accepted the CIGRE Korea/KEPCO International Design Award Grand Prize for BOLD. On the left is Kjell Age Halson of Stanett SF, Norway, with the Bronze prize. In the middle is Henrik Skouboe or BYSTRUP, UK, the runnerup (Gold prize) winner.